Following hot on the heels of their movie-licensed shooter Robocop (Free), Glu Games has finally taken their follow-up to Frontline Commando (Free) and Frontline Commando: D-Day (Free) out of soft launch and into wide release. 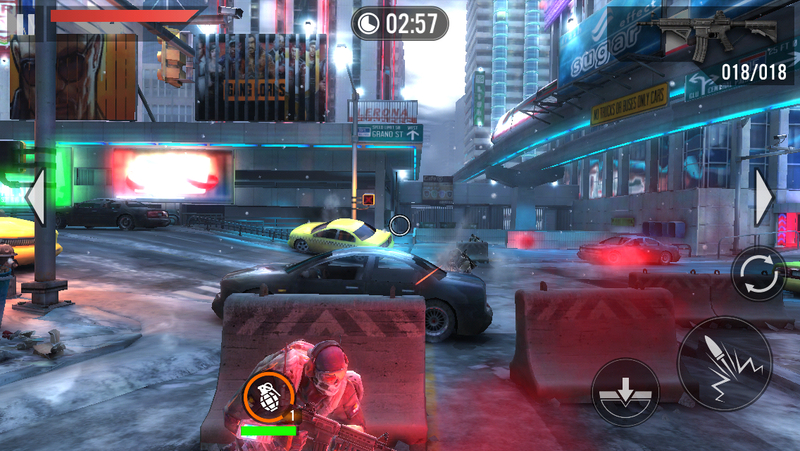 Robocop itself used many of the same mechanics as the Frontline Commando games, so it’s perhaps not that surprising that some of the new elements in Frontline Commando 2 (Free) echo certain parts of it. Luckily, one thing they didn’t carry over, at least not completely, is the stamina meter, but even without that hanging over its head, Frontline Commando 2 is kind of a dud sequel, particularly when held against D-Day. Before I really get into it, let’s get it out of the way. Yes, this is a free-to-play game, and its design reflects that at almost every level. Ads will occasionally pop up between battles, upgrades have timers on them, there’s a premium currency that can grease all kinds of wheels for a price, and the difficulty is stacked against you such that by a certain point in the game, you’ll almost certainly need to grind. These are all aspects that in a perfect world would not be present in the game and the experience would be better for it. If free-to-play elements turn you off, you may want to do a little 360 and moonwalk out the door right now, because apart from lacking a stamina meter in its campaign mode, all the all-stars of that type of design are here. 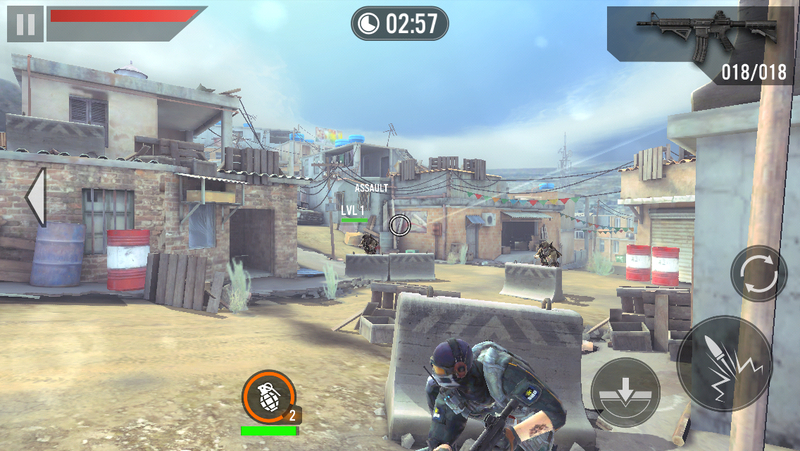 Rather than placing you in any real war as its predecessors do, Frontline Commando 2 puts you in the role of a mercenary who has been left for dead and is seeking revenge. Like the other games in the series, this is a third-person cover shooter, with no actual freedom of movement. The environments are distinctly more urban than the settings in the previous two games, and your main character isn’t quite so identifiably part of the American military. One of the most obvious new aspects is that in this game, you have to build a squad to support you in combat. They’re actually not entirely useless, and will often kill enemies on their own. They are, however, yet another money sink in a game that really didn’t need more, since you have to train them up as you go along if you want to have a chance. In total, the campaign spans just over 50 missions, a decent amount even if it is dwarfed by the mission counts in its frequently-updated predecessors. Each mission has you taking out a set number of targets, trying to check off sub-goals on the way for extra money. After a set number of missions, you’ll face off against a boss, after which you’ll get another piece of the story delivered via a cut scene. The missions themselves don’t run more than a few minutes in length, making for a fairly short game if it were just a matter of smashing your way through. Naturally, that’s not possible, since your weapons, health, and squad are rapidly outpaced by the escalating power level of the opposing forces. Clearing missions earns you various rewards, but first and foremost is cash. You can use cash to upgrade your weapons, train your squad, and buy some of the new weapons. You’re going to need to do all of these things to keep moving along in the missions, and in order to have enough cash to do so, you’re probably going to have to go back to previously cleared missions and grind some out now and then. You’ll also earn other rewards if you clear sub-goals, such as gold, items, and new squad members. The sub-goals are varied, having you to do things like rack up a certain number of headshots or destroy enemy transport vehicles, giving you something to do in each stage besides point and shoot mindlessly. Getting the new squad members is particularly important, since, like your weapons, at some point your earlier members are going to become virtually useless, no matter how much you upgrade them. That’s the campaign mode in a nutshell. Play missions until you are no longer able to progress, go back, grind some money, upgrade, and try the mission again until you’re finally able to proceed. The shooting action is simple but reasonably satisfying, with the sniper rifle feeling as awesome as ever. At least, until the enemies get too strong and no-sell two headshots. At that point, the feeling is most certainly not awesome. The actual mechanics of the game feel simplified even compared to the older games. You don’t have to worry about running out of ammo and having to find an ammo box to restock. You won’t be running from location to location within a level. Even sliding around in cover is more limited than before, since, as in Robocop, you’re generally limited to two pieces of cover, something that gets particularly irritating once enemies get strong enough to destroy it in a few shots. Even your squadmates don’t change much of the combat. They’ll hang behind their cover and take shots, and you can press an on-screen button for each of them to use their specific talent, such as throwing a grenade or using a health kit. Using that talent requires having the item, though, and said items can only be bought with premium currency, aside from the handful you’ll earn by finishing sub-goals. It’s safe to say you won’t be making heavy use of those skills as a result. The sad thing is, Frontline Commando was already a very simplified shooter, and while D-Day took things a big step forward in most regards, Frontline Commando 2 feels like a solid step back from even the first game in terms of complexity. The other major addition to the game, and the one way where it decisively offers an advantage over prior games in the series, is the PVP mode. You face off against another player’s CPU-controlled team, and the winner gets some cash, experience points, and ranking points. If you do well enough, you can win some nice stuff, but you really have to put time into it, an effort limited by the inclusion of a stamina meter exclusive to this mode. You get three matches before you have to wait for your timer to restore. Each point takes 20 minutes to replenish, so you can really only do a few matches per hour. The spoils on a per-match basis aren’t any better than the rewards in campaign mode, so I’m not exactly sure what the reasoning is behind the existence of this timer. Naturally, you can feed the meter gold if you want to refill it early. Oh wait, I think I just found the reasoning behind the existence of this timer. The game looks great, even excellent at times, though the death animations are still hilariously bad. The new environments show off all kinds of effects, and the enemies and the vehicles are all nicely rendered with a good amount of detail. The sound effects and music are typical for the genre, but solid enough, with the gunfire and explosions sounding good and the music never distracting. Game Center is fully implemented, with four interesting leaderboards and an absolutely massive list of achievements to earn. In terms of presentation, this is the best game in the series by far, though it only rivals Robocop rather than surpass it. In a vacuum, Frontline Commando 2 is fine enough. It’s a good way to kill a bit of time, and there’s a nice feeling of progression as you gain new gear and power up. While there is some equipment gated behind the premium currency, you can play through the whole game and enjoy a pretty wide arsenal even without spending anything. I also like that there aren’t any energy timers in the campaign mode, since that was a real buzzkill in Robocop. It’s a grindy game, to be sure, and you can definitely pay to win, but it doesn’t feel like you have to pay as long as you’re tenacious. That’s how it is in a vacuum. In reality, Frontline Commando 2 isn’t quite the game the first one is, and isn’t even half the game D-Day is. The experience was already simplified and streamlined, and taking it a step further leaves precious little on the bone, relatively speaking. I love the idea of the squads and the PVP, but these meager additions do little to make up for the near-total loss of any strategy in the combat. If you’re a fan of the series, by all means, give it a shot. It’s free, so you don’t have anything to lose, after all. However, if you haven’t played any of the games in this series before and are somehow only now interested, I’d advise you to play Frontline Commando: D-Day over this, anytime. I hope if Glu Games plans on continuing this series that they’ll start adding complexity rather than taking it away.